Otherwise Unseeable is the winner of the 2014 Four Lakes Poetry Prize*. Betsy Sholl sure can throw down the line. She can be crisp and clean and concise or she can take that long, slow dance. Either way the reader wins. These are accomplished poems by a very confident author. And rightly so, as my dear friend Mary Brett would say. Sometimes on the tenor I try to get a sun sound. master of lights out, guide through the starless night? calls moon zellar, its banged-up metallic mouth. and reed, needs muscle, breath, two puffed cheeks. if a stroke nails one hand down. wind in B-flat? Well, shut your damn eyes." This is poetry with humour, pathos, grit and eloquence. There is a dark undercurrent at work in these poems as Sholl attempts to, as Maryse Holder said, "give sorrow words". Sholl isn't afraid to look at our hostile nature or the bargains we make to endure. go to rot, till even its eye roots oozed. infected right to the doorstep,. knobby lumps gone to mush in the hand. they'd gladly break their teeth on. of absolute silence could be a root. as I've been taught, so nothing is lost. Sholl's Otherwise Unseeable resonates with a jazz lover's heart and a world weary clouded humour. These sad poems are so joyously alive. These joyous poem are all so jazz solo sad. Take your pick. What I really liked was feeling swallowed by it all. Sholl is completely committed and the reader gets that. she pushes more chips onto the felt. waves rise to a curl, then calmly subside. of people gazing through glazed fixations? already shedding sequins along a split seam. erasing all but its own brilliant self. Betsy Sholl is the author of seven collections of poetry, including Late Psalm and Don't Explain, 1997 winner of the Felix Pollak Prize in Poetry. A former poet laureate of Maine. Sholl teaches at the University of Southern Maine and in the MFA Program of Vermont College. She lives in Portland, Maine. "For a good four decades now, Betsy Sholl has been producing a poetry of stern self-reflection, risky lyrical fluency, and a deeply empathetic social consciousness. With Otherwise Unseeable, she gives us her finest collection thus far, a book which has refined itself into something I can only call wisdom—sometimes rueful, sometimes fierce. This is work in which, as one poem memorably puts it, we must 'unlatch our wounds and love our ruins.'" 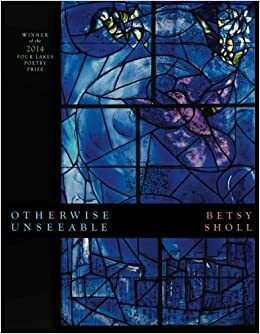 "Betsy Sholl's new book, Otherwise Unseeable, is faithful, as is all her work, to the contradictions we live with from day to day. These deeply earned, masterful poems take in the full range of human nature, looking unflinchingly at human evil and human suffering, while also acknowledging the gound-note of joy that waits to be heard in our daily lives. Sholl's poems can be elegiac and mournful; they can riff and fly on the force and spirit of their own language as they chart a path between despair and hope, making seeable what is 'otherwise unseeable,' as they give us glimpses of a 'kingdom' which is always here and always to come." "It's a haunting thing, this new book by Betsy Sholl—a haunted sequence of grievings for the dead, dying, and otherwise unnoticed. Even lowly wildflowers—'chicory, ironweed, aster, thistle, joe-pye, /poorest of the poor'—are honored here, as is a whole horde of literal and figurative gypsies with 'a voice of pocket lint.' Haunting to is this book's tribute to music's power to build 'a bridge from verse to verse' across our ruins. This poet's erudite compassion for everyone and everything—her unwavering humanity—what a wonder that is! What a gift to us." *The Four Lakes Prize in Poetry is given annually to one new book of poetry submitted by a past winner of either the Brittingham and Pollak competitions, and is selected by an editorial board comprised of poets in the University of Wisconsin’s creative writing program. Submissions to the Brittingham and Pollak competitions by previous winners are automatically considered for The Four Lakes Prize. With this prize the Press will continue to welcome poets new to the Series through its annual competitions, while supporting the winners’ further development by publishing new works.